Deposit Methods: Bank Wire Transfer, EcoAccount, NETELLER, Skrill, MasterCard, Visa. Currencies accepted: South African Rand. 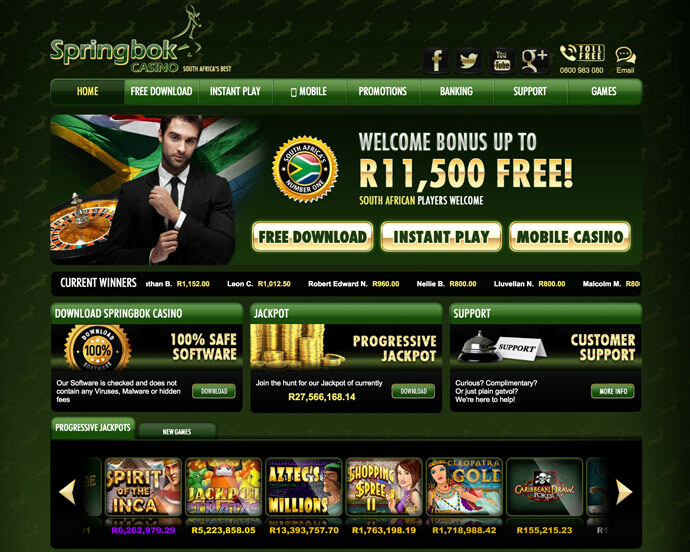 Springbok Casino celebrates everything that's lekker about South African culture by offering you premium, world-class internet casinogaming software overlaid with enough local flavour to make you go "Jislaaik – that's cool." We offer more than 200 online casino games, covering all the table favourites and including a range of top-notch themed slots. If you're a first-time visitor, we'd like to extend you a big first deposit casino welcome bonus by offering you up to R11,500 just for joining us. Mobile version available.